Introduction: Dental caries and periodontal diseases are multifactorial oral health problems that have dental bacterial plaque as their main etiological agent. Dental plaque removal plays an important role in oral health maintenance, which could be achieved by either mechanical or chemical plaque control. Disclosing agents in dentistry are being used to identify bacterial plaque for instruction, evaluation and research purposes. Hence, the current study is aimed at evaluating the effect of at home use of disclosing agent in improving the quality of daily oral hygiene. 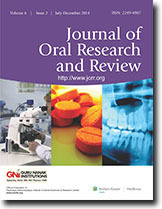 Materials and Methods: The present randomized, prospective case-control study was conducted among 100 subjects who were selected from the outpatient department of periodontology and divided into two groups. Group A (n = 50) is the case group who were instructed to use a disclosing agent and Group B (n = 50) is the control group who were not instructed to use a disclosing agent. Plaque status of the subjects was assessed using "Turesky-Gilmore-Glickman Modification of the Quigley Hein Plaque Index" at baseline. Both the groups were trained to perform the similar brushing technique along with same oral hygiene instructions. After 21 days, both groups were recalled, and their plaque status was re-assessed by the same method. 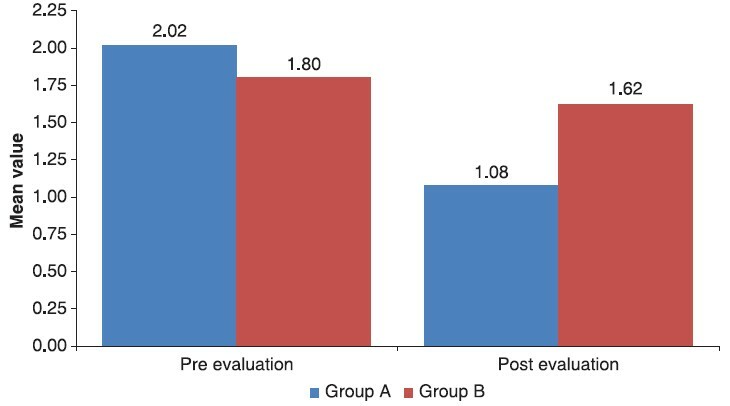 The pre and postplaque scores of both the groups were evaluated by unpaired t-test and value of P < 0.05 was considered significant. Results: Preevaluation plaque score of Group A was 2.02 ± 0.24 and postevaluation score was 1.08 ± 0.26. Similarly in Group B, the preevaluation plaque score was 1.80 ± 0.92 and postevaluation score was 1.62 ± 0.48. The difference in the plaque scores was statistically significant with a P = 0.00001. Conclusion: The result shows that usage of plaque disclosing agent improves the quality of daily oral hygiene measures performed at home. Malignant melanoma is a rare tumor arising from the uncontrolled growth of melanocytes found in the basal layer of the epithelium. Although cutaneous malignant melanoma is the third most common malignancy of the skin, it accounts only for 3-5% of all dermal malignancies. 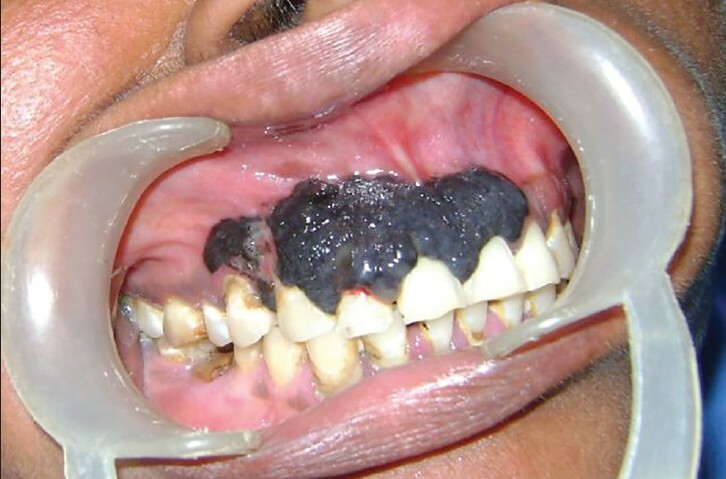 Primary malignant melanoma of the oral mucosa is extremely rare, accounting for only 0.2-8% of all malignant melanomas. The incidence is slightly higher in males while others report a higher incidence in females. In the oral cavity, 80% of the cases occur in the maxilla with the prevalence of the hard palate or combined with the gingival or alveolar ridge. In this paper, we present a rare case of a 47-year-old female patient who reported with completely asymptomatic, pigmented growth in the maxillary anterior region. Myoepithelioma (ME) is a rarely encountered tumor of salivary gland accounting for about 1% of all salivary gland tumors. Though they were first identified long back, still their histopathologic features and immunohistochemistry (IHC) profile are not well characterized and there is no definitive criterion for this tumor with complex and varied features remaining a major barrier. We present a case of parotid enlargement in an 18-year-old girl in whom the IHC studies of superficial parotidectomy specimen revealed positive staining for Cytokeratin 5/6, HMW CK, Smooth muscle actin (SMA), S100, calponin, vimentin, and p63. CD45, EMA, CK7, carcinoembryonic antigen (CEA), BerEP4, GCDFP-15, and Glial fibrillary acidic protein (GFAP)-stained negative. With these IHC findings, the diagnosis of ME of parotid was established. This report highlights the importance of IHC studies along with a brief review of the literature. The calcifying epithelial odontogenic cyst (CEOC) is a developmental odontogenic cyst, which was first categorized as a distinct entity by Gorlin in 1962. It is an unusual and unique lesion, which may show characteristics of both a solid neoplasm and a cyst. It usually occurs as an intra-osseous lesion but may occasionally occur as an extra-osseous or peripheral variant. 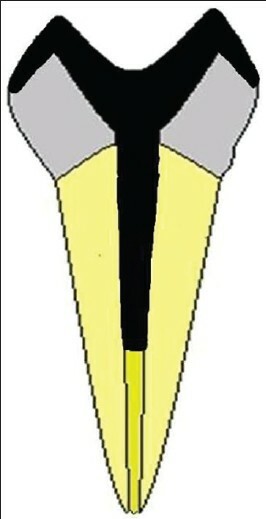 It shows a nearly equal distribution between the maxilla and mandible and is commonly seen anterior to the first molar. The clinical and radiographic features of this lesion are not pathognomonic, and it is characterized by its histological diversity, with the most characteristic feature being the presence of a variable number of ghost cells within the epithelial component. Treatment is conservative with surgical enucleation, and recurrences are rare. 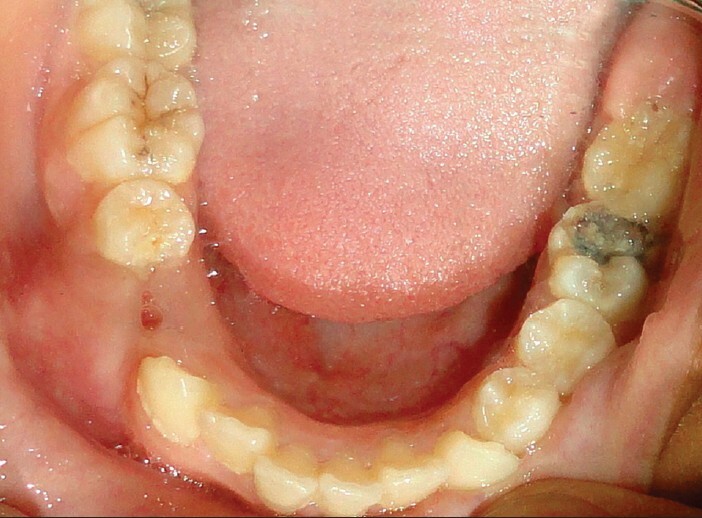 This report describes a case of CEOC in association with an impacted mandibular first premolar, which was diagnosed in a 13-year-old female patient, along with a review of the literature. Radicular cyst is one of the most common odontogenic cysts of the jaws, but those arising from primary teeth are very rare. 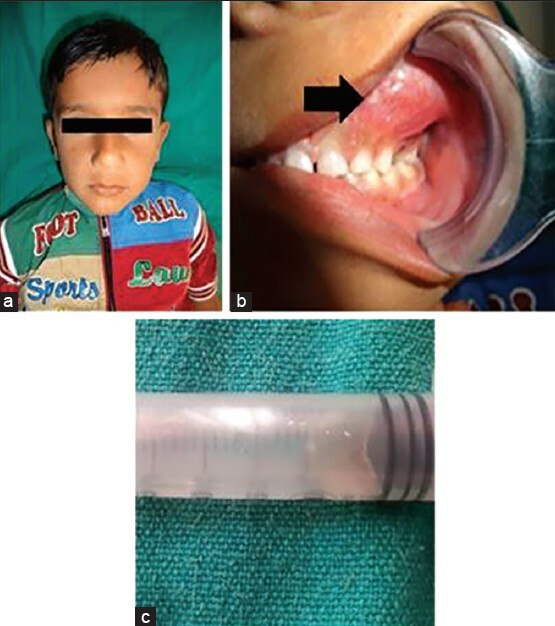 This article reports two such rare cases incidentally affecting deciduous maxillary teeth. Oral submucous fibrosis (OSMF) is a precancerous condition. It causes difficulty in swallowing, chewing and speaking due to the presence of microstomia. 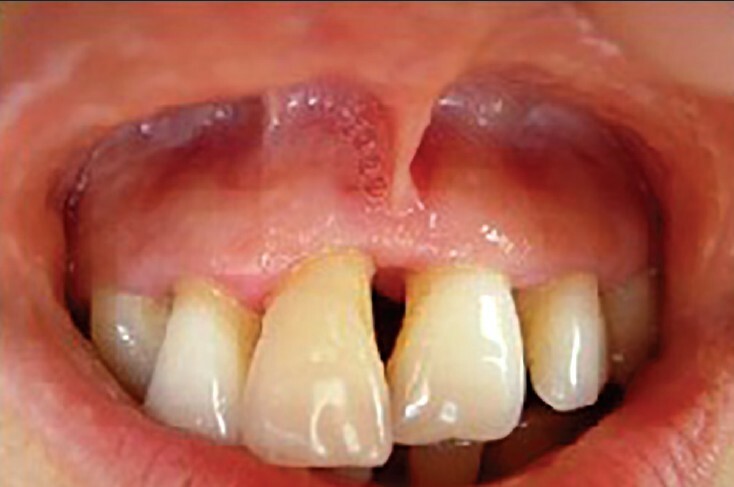 Limited mouth opening is considered as a hindrance in prosthodontic rehabilitation of a patient. Special impression procedures and techniques should be considered for making an impression in such cases. This article describes the fabrication of a split impression tray to make a secondary impression of an edentulous patient having OSMF. Periodontal attachment loss in the maxillary anterior region can often lead to esthetic and functional clinical problems including disproportional and elongated clinical crowns and visible interdental embrasures. Gingival replacement prosthesis has historically been used to replace lost tissue. A gingival mask is an easily constructed and practical device to optimize the esthetic and functional outcome in these special situations while permitting cleansibility of the prosthesis and supporting tissues. This is a case report of a young female patient treated using silicon gingival veneer with a 2-year follow-up. The silicon gingival mask has enabled the patient to regain her lost smile and face people with newly found confidence also enhancing the esthetic appearance. Virtually, no problem was encountered during the 2 years of usage of the veneer and the patient continues to use it comfortably. Mineral trioxide aggregate (MTA) is a unique material with several exciting clinical applications. MTA has potential and one of the most versatile materials of this century in the field of dentistry. During endodontic treatment of primary and permanent tooth MTA can be used in many ways. MTA materials have been shown to have a biocompatible nature and have excellent potential in endodontic use. MTA materials provide better microleakage protection than traditional endodontic repair materials using dye, fluid filtration, and bacterial penetration leakage models. In both animal and human studies, MTA materials have been shown to have excellent potential as pulp-capping and pulpotomy medicaments. MTA material can be used as apical and furcation restorative materials as well as medicaments for apexogenesis and apexification treatments. 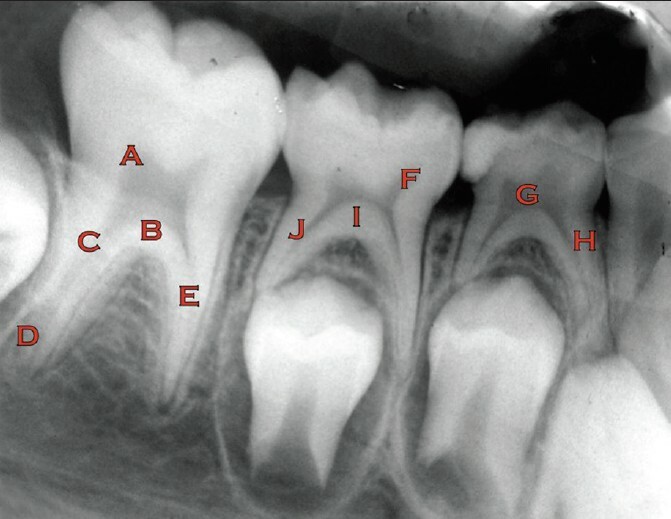 In present article, we review the current dental literature on MTA, discussing composition, physical, chemical and biological properties and clinical characteristics of MTA. Root canal treated teeth are structurally compromised as a result of loss of tooth structure due to caries, iatrogenic cavity preparation, and dehydration. Given that a direct relationship exists between the amount of remaining tooth structure and the ability to resist occlusal forces, it is vital to provide a restoration allowing cuspal coverage as soon as possible following completion of the root canal treatment. A decision to provide a full crown or an onlay depends on the remaining tooth structure, if the cuspal width to length ratio is 1:2 or more, an onlay can be placed. When the ratio is <1:2, a full crown has to be planned. In single rooted teeth requiring postendodontic restoration cast post and core or a prefabricated post can provide resistance to fracture with comparable results. However in case of premolars, where only cuspal coverage is being practiced, it would require cervical reinforcement in addition, to counter the horizontal force acting at the cervical region. A new onlay design with a post extending into the radicular portion of the premolar providing the required reinforcement in a conservative manner and protecting it against both vertical and horizontal forces is proposed herewith called as SHARONLAY I.P. no 1956475.